Walk, Hike, Go! Buenos Aires, Argentina - Sunsar Maya | CommitChange | We help organizations raise more money, more sustainably. CLICK THE "CONTRIBUTE" BUTTON TO THE RIGHT TO SIGN UP AND DONATE ANY AMOUNT TO SUPPORT THE KIDS OF SUNSAR MAYA. EVERY DOLLAR HELPS! Walk, Hike, Go - YOGA! Join us for a morning yoga session, led by Sandra Kessel, in support of Sunsar Maya--a nonprofit organization helping women and children living in desperate conditions in Nepal build pathways out of poverty. Our goal is to raise $600 USD which is enough to provide everything a student needs for one year - including academic support, healthy meals, medical and dental care. Never done yoga before? No worries! This event is open to all levels and is an opportunity to learn and build community in support of a great cause. All are welcome! *Please bring water and a yoga mat or towel. What is "Walk, Hike, Go!"? Walk, Hike, Go! is a 48-hour fundraiser for Sunsar Maya on September 15th-16th in locations around the world! Groups of friends will gather to raise awareness and funds for Sunsar Maya. All kinds of activities are welcome: a hike up a nearby peak, a stroll through a local park, a bike ride to your favorite bars–whatever fun you can come up with! Sunsar Maya builds pathways out of poverty by improving the livelihoods of vulnerable children and women through holistic, community-based services. 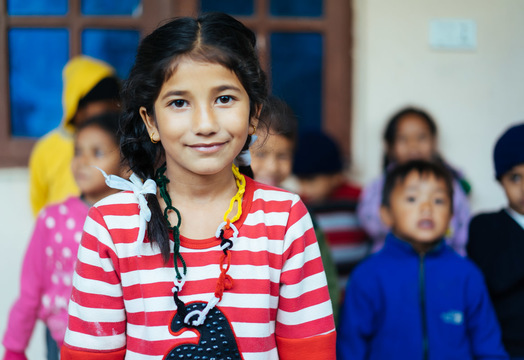 We currently operate two community centeres in Nepal, where we provide an after-school program for youth ages 3-18, a women's literacy program, and trainings for rural teachers. Our goal is to provide our students with the academic, emotional, and physical support they need to lift themselves out of poverty and find long-term happiness and success in life. Click the "Contribute" button to the right sign up and donate any amount to support the kids of Sunsar Maya. Every dollar helps! You can even start your own campaign and host a fundraiser or hike event. Last, you can follow us for future updates on Facebook, Instagram, and Twitter. Look for event images or share your own with the hashtags #WalkHikeGo and #SuMa.